I bought groceries today, my second day in the city. 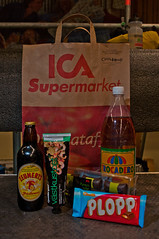 I am glad to see many familiar items, mainly in the produce section, although I do want to learn the Swedish words for them. The rest of the store is a bit of a mystery as I really have to take time to figure out what the packages are saying, and goodness knows when I will be able to read the directions on the labels. Anyway, I quickly learned why everyone without a car travels with either a wheeled suitcase, or shoppingsväska. I opted for the latter because I think it’s too much trouble to lay down, zip/unzip/dig into a suitcase all the time, plus, I wanted to feel less like a traveler and more like part of the culture. The shoppingsväska (shopping suitcase) is a wheeled cart with a large bag attached. Mine is made of canvas and the bag slides over the handle so you can use just the cart if need be, or toss the bag in the wash, I suppose. Others might have a bag made of plastic-coated nylon. I can just drop my purchases inside and go. If I think I might buy anything, I won’t go out the door without it. E teases me that I’ve created a new culture because traditionally only old women used the carts. It doesn’t seem that way from my observation, but even if so, he sure hasn’t minded using it himself!